Hi - I am a (very) entrylevel user of Wordpress and have an issue with code in our function php. 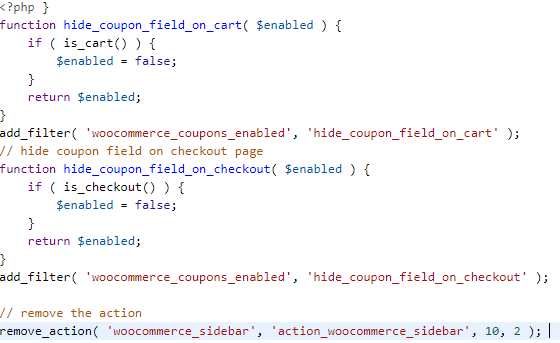 Prior to my start, a previous user added code to hide a coupon field that we now want to reappear. I don't know how to get rid of the code that was created to hide it (i tried just deleting the block to no avail, I kept getting an error). Is there an easy fix for this? I just want to get rid of the code to hide it. I provided a snapshot of the code. If you start by commenting out the two lines that begin "add_filter" (so make them "// add_filter", that should tell you whether you've had the desired effect. If you have, delete the two functions above. Finally, do the same (comment, try, delete) for the remove_action line. If that doesn't do it, it's somewhere else in your file. Just comment on the add_filter functions, but it seems that you have problems with the permissions to edit the file, try to enter your C-PANEL and edit it directly or with your FTP account. Is your problem solved ? if you having problem you can provide me access at: [email protected] and I will solve it. That's all you need to do to get rid of the functionality. "Something went wrong. Your change may not have been saved. Please try again. There is also a chance that you may need to manually fix and upload the file over FTP." Copy the functions.php code, edit it locally and then upload via FTP. But looks to me there is a file permission issue as you are not able to edit it via wp admin. If that's the case, you need to fix that first. You can use filezilla or some other FTP client to edit the file directly vi FTP. Follow John's advice for actual code editing. That is the safest way. Are you editing via wp-admin editor? Best way to edit file is via FTP. I have this experience where it throws an error on the admin code editor,but its already edited on the FTP.